The movie is about people who risk their life to escape from North Korea through the Yalu (Ap-lok river). The title ‘48m’ means that the shortest distance of the Yalu between Ryanggang of North Korea and Changbai County of China. Heroine is a river-crossing man who across the border into China. She helps North Korean refugees to find younger sister who was separated her childhood. She plays the part of the villain who demands a large sum of money from North Korean refugees. There are complicated circumstances behind the matter. She has to bribe North Korean border guards. She does not say no to taking on dangerous tasks for one purpose. In the end, she met her youngest sister. However, she didn’t actually recognize her sister, and demands money her sister. Over time, people gathered to escape from North Korea, and heroine has to help the refugees. However, they are at risk because of unforeseen incident. 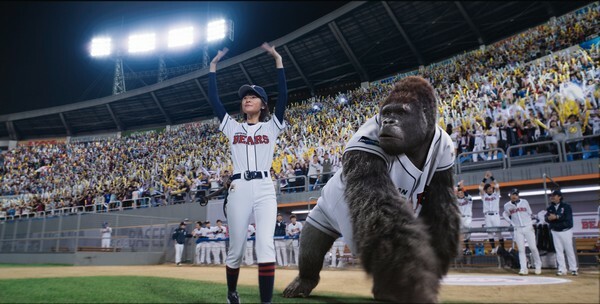 The movie conserves everything in order to say that reality and human right in North Korea. Light, sound, story, emotion, etc. All that are restrained. There is nothing to disturb audience face the truth. Director focuses on reality of North Korean refugees than his individuality and color. So the movie is unobtrusive and heavy. The movie neither criticize the North Korean regime nor deny them in order to say human rights of North Korean defector. If anything, the movie accept the fact that North Koreans are human beings even as we are. They eat with their family like us. And they have lover and young child and parents like us. They were forced escape from North Korea due to unavoidable circumstances rather than they don’t like regime. Their homeland is also precious to them. Ironically, it seems that the North Korean regime don’t think they are worth something. As you can see, the movie have not a touching storyline. And it don’t make audience sad intentionally. In climax, I was unfazed by tragedy because the situation was expected to some extent. By the way, after roll the end credits, I couldn’t keep back my tears. Maybe it is because that I realize the movie is nonfiction at that moment. What can I do for them in this reality that most of those who escaped North Korea into China were sent back home. 이 영화는 압록강을 통해서 목숨을 걸고 북한을 탈출하는 사람들에 대한 이야기이다. 여기서 48미터는 북한 양강도에서 중국 장백현 사이에 흐르는 압록강의 최단 거리를 뜻한다. 도강꾼인 여주인공은 어린시절 헤어졌던 여동생을 찾기 위해서 목숨을 담보로 압록강을 넘나들며 탈북자들을 돕는다. 거액의 돈을 요구하는 그녀도 사실 북한경비대에게 돈을 건네야 하는 사정이 있다. 위험한 일을 마다하지 않는 여주인공은 정작 여동생을 만나고도 알아보지 못하고 거액의 돈을 요구한다. 북한을 탈출해야만 하는 사정을 가진 이들이 모여들고 여주인공은 이들을 책임지고 압록강을 건네주어야 한다. 하지만 이들을 방해하는 뜻하지 않는 사건들이 터지게 되고 사람들은 위험에 처한다. 영화는 북한의 현실과 인권에 관해 말하기 위해서 모든 것을 아낀다. 빛 소리 스토리 감정 모든 것이 절제된 영화에서 관객이 진실과 마주하는 것을 방해할 것은 아무것도 없다. 감독은 자신의 개성과 색채보다 탈북자의 현실에 집중한다. 그래서 이영화는 무척 수수하면서도 묵직하다. 영화는 탈북자들의 인권을 말하기 위해서 북한정권을 비판하거나 그들을 부정하는 방식을 취하지 않는다. 오히려 북한주민이 우리와 다를바 없는 사람이란 사실을 인정한다. 그들도 우리처럼 식구들과 밥을 먹고 연애를 하고 어린 자식이 있으며 아픈 부모가 있다. 정권이 싫어서라기 보다는 모두들 피치 못할 사정으로 인해서 고향을 등지게 된다. 이들에게도 고향은 소중하다. 아이러니하게도 북한 정권은 주민들을 그리 소중히 대하는 것 같지가 않다. 보다시피 이 영화는 감동적인 이야기를 가지고 있지 않으며 많은 슬픔을 자아내는 방식을 취하지도 않는다. 클라이막스의 비극도 어느 정도 예상하던바라 크게 동요하지 않았다. 그런데 엔딩크레딧이 올라가는데 눈물이 흐르는 것을 막을 수 없었다. 아마도 그순간 영화가 단지 허구가 아니란 걸 깨달아서였기 때문일지도 모르겠다. 중국으로 넘어간 탈북자 대부분이 다시 북송되는 현실에서 과연 나는 무엇을 할 수 있는가? 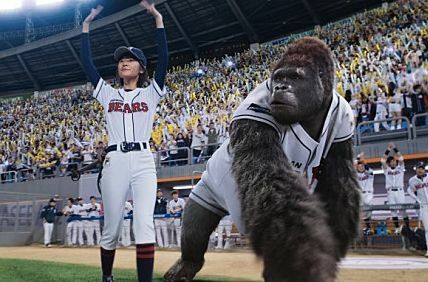 ‘Mr.Go’, Can the 3D gorillas hit a home run in China, too?